1966-1967 Trinity Evangelical Divinity School, Deerfield IL, M.A. (honors) in O.T. Dr. Livingston has directed fifteen seasons of excavations at the Associates for Biblical Research's site for Biblical Ai (Khirbet Nisya, 11 miles north of Jerusalem). His doctoral dissertation was a complete report on six seasons of excavation at Khirbet Nisya. He has participated also in excavations in Jerusalem, Jericho (twice), Jezreel, Bourgata, and Gezer. And he has conducted more than 25 tours in Israel, Jordan and Egypt. David Livingston has been an adjunct professor at colleges and seminaries in the U.S. And he has traveled extensively in Europe also, teaching modular courses in Bible schools and seminaries in Sweden, Norway, Denmark, Germany, France and Latvia. In the U.S. he has also given more than 50 seminars on scientific creationism and biblical archaeology. As Founder and former Director of ABR (25 years total), and five years as a college president (in Korea), Dr. Livinsgton has had considerable experience in administration and working compatibly with others. While editor of ABR's magazine (six years) and newsletter (20 years), he has written and published many articles on Biblical studies, ancient history, and creation-evolution issues. 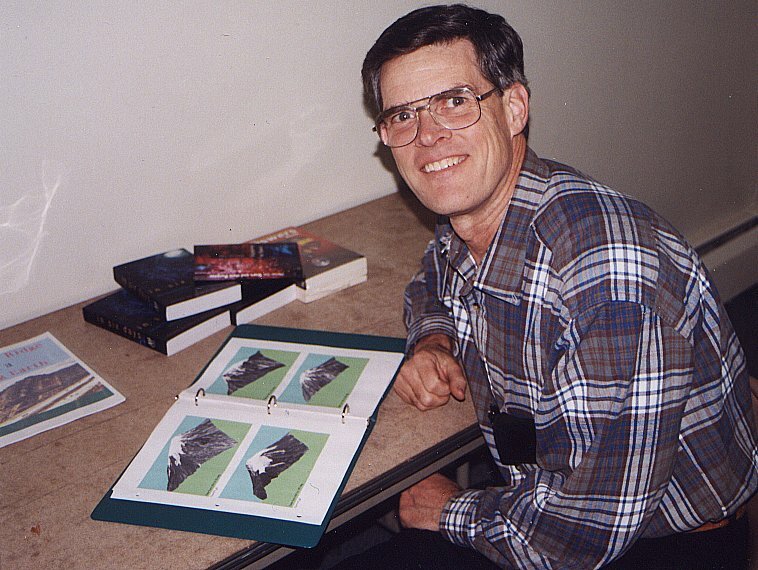 1986-Present Volunteer engineering assistant for FM radio network of Colorado Christian University, helping establish 4 translator stations for KJOL and 1 satellite repeater for KWBI in mountains of southwestern Colorado. Book chapter from "In Six Days..."
Tom has extensive experience with airborne remote sensing technologies. His career in this area spans 25 years. He has provided systems engineering leadership and expertise in a variety of airborne remote sensing systems. His systems engineering and operational experience has been applied in the development of new systems as well as working closely with operational systems. He is also a certified U.S. Air Force flight crewmember. Systems Engineer and Remote Sensing Technologist. Gary Pryor's specialization in transactions is rooted in his extensive Wall Street experience, which began with Merrill Lynch International and the Morgan Guaranty Trust Company of New York (JP Morgan). During his tenure at Morgan, he proved his skills in Morgan's fixed income securities department. Pryor left Morgan to form his own corporate finance firm in New York assisting middle market food-related companies with mergers and acquisitions, and corporate finance. He was a partner with management in many of the 20 plus projects he directed in Boston, New York, Washington DC, Los Angeles, Arizona, Prague, and Nairobi, Kenya. Pryor specialized in retail and institutional food and beverage capitalization and sales/exit facilitation. He is well known throughout the food industry as one of the founders of the "Home Meal Replacement" industry. Pryor was recruited by Arizona based Circle K Stores Inc / Tosco to manage a 217 store fresh food program and develop a hybrid grocery/restaurant, prepared foods store. Following his tenure with Circle K, Pryor joined Hunter Wise Financial Group, a California based NASD investment banking firm, as the partner in charge of mergers and acquisitions, where he specialized in buy-side representations for private equity groups seeking to acquire food-related companies. Following his tenure at Hunter Wise, Mr. Pryor acquired several food related businesses including three USDA certified frozen food manufacturing companies as well as multiple restaurants throughout the United States. Mr. Pryor specializes in consolidation strategy and facilitation, and partners with strategic private equity and mezzanine sources of capital in the food and beverage industry. Mr. Pryor received a BA in Government from the St. Lawrence University in Canton, NY and the University of Nairobi in Kenya, East Africa. Certified Corrosion Control Technician, BMS Cat. Inc.
Certification in Ground Penetrating Radar for Archaeology, Geophysical Survey Systems, Inc.
David is the Director of Computer Services, Information Security Officer and Part-Time Religious Studies faculty for Atlantic Baptist University, Moncton, New Brunsick, Canada. He also teaches Archaeology in the ABU-Oxford programme in Oxford, England. For the past ten years he has been President of Electronic Christian Media, having authored The Biblical Scroll, Interactive Study Bible distributed through Egames, Inc. Prior to working at ABU for 17 years David owned two Steamatic cleaning and fire restoration franchises in Moncton and Saint John, New Brunswick, Canada. During this time he also travelled with BMS (Blackman Mooring Steamatic) Catastrophe Inc., Fort Worth, Texas as a certified corrosion control technician and supervisor. He is presently working on his Ph.D. in NT Exegesis from the University of Aberdeen and Highland Theological College in Scotland. David is a member of the Associates for Biblical Research, Near East Archaeological Society, and The Canadian Archaeological Institute at Athens. He has travelled to many archaeolgical sites in the Middle East including Egypt, Turkey, Jordan and Israel. He was part of the Tell el-Hammam, Jordan Archaeological excavation project in 2005-2006. He is married to Jane and have two adult daughters Rebecca & Jessica. 2006 Team member of the excavation of Tel el-Hammam, Jordan. Performed GPR on the site. 2005 Archaeology Ground Penetrating Radar Training, Geophysical Survey Systems, Inc., North Salem, NH. 2005 Biblical Egypt Study Tour, Associates for Biblical Research. 2004 Turkey Study Tour, University of New Brunswick, Canada. 2004 Ancient Cities & Civilisations of Western Turkey: Myth Cult and History. Classics 3373 Audit University of New Brunswick, Canada. 2004 The Art and Architecture of Asia Minor: Hellenistic, Roman and Early Christian. Classics 3383Audit University of New Brunswick Canada. 2004 Certified Packeteer training Level 1, Dalhousie University, Nova Scotia, Canada. 2003 Atlantic University and College Technology Conference, (AUCTC) , Mount Alison University, Canada. 2003 British Museum - Research on coins of Smyrna in numismatics department, London, England. 2002 IBM Higher Education Technology Solutions Executive Briefing, Raleigh, North Carolina. 2002 Novell 6 Remote Management and iFolder, Halifax, Nova Scotia,Canada. 2002 Information Technology Forum on Infrastructure Security, N.B. Community College, Moncton, N.B. 2001 IBM ThinkTank, Acadia University, Wolfville, Nova Scotia, Canada. 2001 Accpac Advantage Series Information Seminar, Grant Thornton, Moncton, N.B., Canada. 2001 British Museum - Research on Assyrian Reliefs and Ur, Private photo–video session, London, England. 1998 NAWeb’98 International Conference on Distance Education, University of New Brunswick, Fredericton, New Brunswick, Canada. 1998 Christian University Global Net Conference, CUGN, Denver, Colorado. 1996 Trip to Israel, research and photo shoot for The Scroll, various biblical sites. T.A.B.E.C. (Turkish-American Business, Education, & Cultural Development Committee) President Suheyla Gencsoy and her husband Tahsin live in Ft. Lauderdale, Florida. ArcImaging gave presentations to a foundation along with Suheyla and then secured a financial commitment at the time. Suheyla has been supporting ArcImaging as its Director of International Relations for Turkey and has visited officials in Turkey on ArcImaging's behalf. Suheyla was also instrumental in helping promote the Kenan Evren Scholarship Chair in Turkish Studies at Florida Atlantic University.